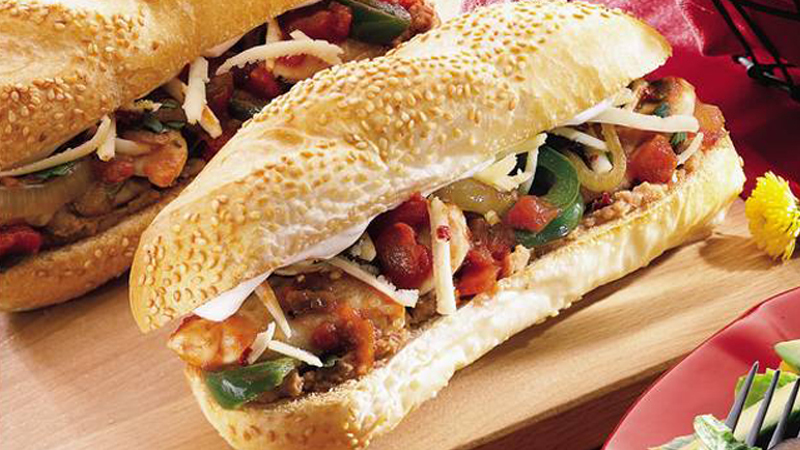 Mexican flavours in your classic sub. You won’t be able to resist. 1. Heat the oil in a large frying pan over a medium-high heat. Cook the chicken and onion for 3 minutes, stirring, then add the pepper and cook for a further 3-4 minutes, until the chicken is cooked through. Stir in the salsa and remove from the heat. 2. Spread the bottom half of each bun with the refried beans. Spoon over the chicken mixture and sprinkle on the cheese and coriander. Spread the top halves of the buns with soured cream and sandwich together. • Alternatively use any roll of your choice. • Alternatively use beef strips instead of the chicken.